The car and its components are the decisive factors for any racing success. But it’s also the best possible equipment of your pit table that makes you feel ready for any challenge a tough racing day can offer. NOSRAM’s r&d engineers consider this when they design accessories like the all new power-supply. To get the best possible state of the art product, NOSRAM’s r&d department decided to design the all new powersupply completely from scratch. The NOSRAM engineers realized many good ideas: the powersupply has two output connectors for 12V devices. An output current of 20 amps at 13.8V should be far enough for any challenge at a hard racing day. The separate USB charging output allows you to charge your mobile phone or MP3 player. 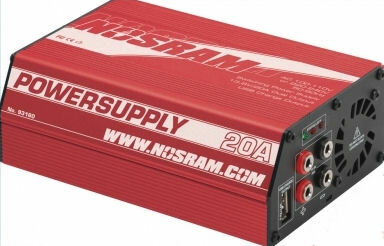 NOSRAM’s all new powersupply is therefore the perfect all-round device to make the time you spend at the track as successful and agreeable as possible. No matter where on the world you’re racing: with its input voltage range from 110V to 230V the NOSRAM powersupply feels at home everywhere. Two different input cords are included. The case is designed lightweight and in compact dimensions. In addition, its red anodized aluminum makes it look really cool.